Queensland: Catastrophic fire conditions, a week long extreme heatwave with record breaking temperatures, mass bushfire evacuations at Gracemere near Rochhampton, State and Commonwealth disaster response plans triggered. But no mention of climate change intensifying heat and bushfires. The MP that brought a lump of coal into parliament house to mock climate action is now the Prime Minister. We might all stand with Queenslanders in this disaster emergency, but there is no acknowledgement we have a climate emergency or even of the damage that denial has done in the last 5 years to make the climate worse. [1/3] Tonight, we all stand with Queenslanders as bushfires burn across the state, threatening homes and communities. These catastrophic fire conditions are unprecedented for the State. I ask that Queenslanders to please heed the warnings and advice of local fire authorities. No mention of the role of coal in rising greenhouse gas emissions. No mention of what the Adani Carmichael coal mine going ahead opening up the Galilee basin for other coal mines, will do to drive further global warming. No mention of the approval last week of the China Stone coal mine in the Galilee basin and what it will do to river and groundwater usage and impacts to agriculture, let alone global warming. No mention of the need to have an effective climate policy that actually reduces Australian emissions in line with the science and agreed global targets. Australia is not on track to meet its 2030 emissions reduction targets warns the latest United Nations Emissions Gap report for 2018 and global greenhouse gas emissions are showing no signs of peaking according to The Guardian. We have never seen bushfires of this intensity and ferocity in November in Queensland. This is the first time that a bushfire emergency in Queensland has been escalated to the top level ranking of 'Catastrophic'. "We have never, ever in this state been in this situation before," Annastacia Palaszczuk told reporters late on Wednesday. "We have not had a catastrophic level. This is uncharted waters." Indeed it is. 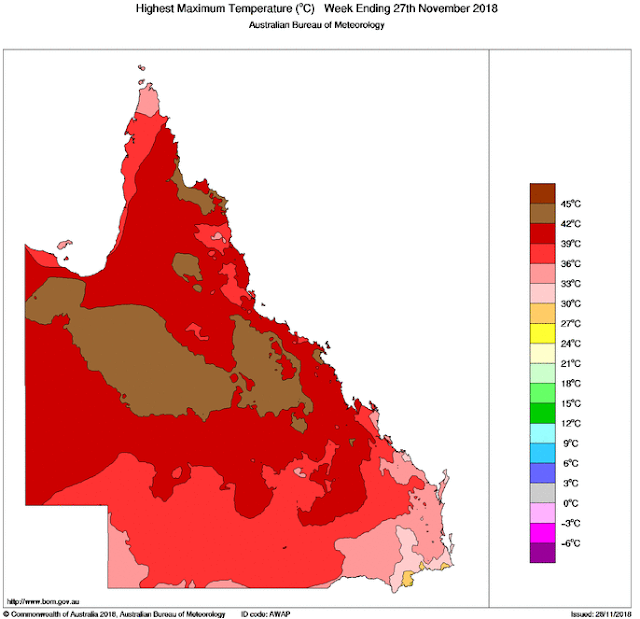 Even though Queensland like the Commonwealth government continues to show the hypocrisy of allowing new thermal coal mines to proceed causing further warming, driving up temperatures, stealing the safe climate future from our children and their descendants. Dozens of record breaking temperatures were smashed this week. At Cairns, where consecutive days reached temperatures of 42.6C and 40.9C. The maximum temperature on Tuesday broke a November record that has stood since 1900 by 5.4C. In a statement on Wednesday morning Queensland Minister for Health Minister and Minister for Ambulance Services Steven Miles warned Queenslanders to prepare for the heat health and extreme bushfire effects. “We have a heatwave gripping large parts of the state, fires in the central regions, dust in the south-east, fallen bats in the north, and high winds and storms for other parts of the state,” he said. “The biggest concern for health authorities today is the heat." 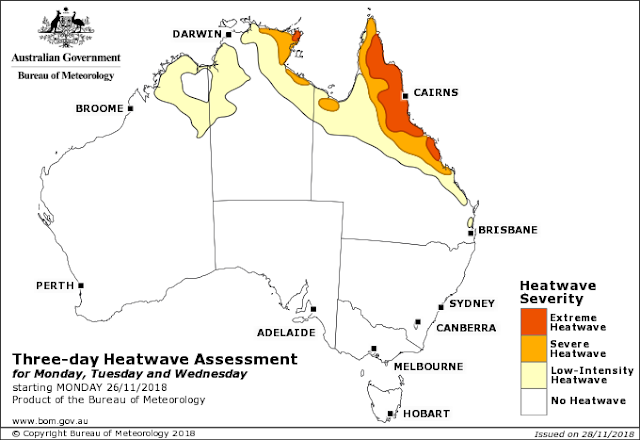 Queensland Health activated the State Health Emergency Contact Centre, and activated the State-wide Heatwave Response Plan. Queensland Acting Chief Health Officer Dr Sonya Bennett urged people to take precautions against dehydration and other heat-related conditions. “Anybody can be at risk of heat-related illness but infants, the elderly, pregnant and breastfeeding women, and people with some pre-existing medical conditions are particularly vulnerable,” she said. “Be alert to the symptoms of heat-related illnesses which can range from heat rash, muscle cramps, and heavy sweating, to paleness, dizziness, nausea, vomiting and fainting. “Drink plenty of fluids, preferably cool water, regularly throughout the day – don’t wait until you’re thirsty. “Stay indoors when possible, preferably in a building with air-conditioning or good air flow, and limit strenuous outdoor activity. “Stay cool by taking cool showers, soaking feet in water or wearing a wet bandana or washer around your neck. “Always check the colour of your urine to ensure you are well-hydrated – it should be clear to light straw-coloured, not dark or gold.” warned Dr Sonya Bennett. The Queensland Ambulance Service has already experienced unprecedented workloads this week, primarily due to heat and fire. On Monday there was a 12 percent increase in incidents responded to by the ambulance service in comparison to the same day last year. Queensland Ambulance service Director Tony Hucker said paramedics had attended 25 heat-related cases on Monday. “We have additional resources in place in the Wide Bay and Finch Hatton areas, with a further 12 paramedics making their way to the Wide Bay region this morning, taking our total deployment to 19; and a further 10 paramedics deploying to support the Finch Hatton area." said Clinical Director Hucker. Clinical Director Hucker articulated the signs and symptoms associated with heat-related illnesses as headaches, nausea, cramps, fainting, excessive sweating, tiredness and dizziness. The Climate Council 2016 report - The Silent Killer: climate change and the Health Impacts of extreme heat - highlighted the danger from extreme heat to human health, and that it is a silent killer that largely goes under the radar of emergency services response. Injured bats could still bite or scratch and may also carry Australian bat lyssovirus which is related to rabies. There have been several human deaths now associated with this virus. Inland and southern parts of Queensland also have a dust storm to contend with. With dust and smoke covering parts of the state, Dr Bennett warned people with respiratory issues should stay indoors with windows and doors closed, and avoid vigorous exercise. “If you are experiencing any adverse reactions to the dust, such as shortness of breath, prolonged coughing or wheezing, seek medical advice,” she said. 1) Climate change is increasing the risk of bushfires in Queensland. Australia is a fire prone country. While damaging bushfires are less common in Queensland than other states in Australia, climate change is now increasing the incidence of extreme heat and making heatwaves longer and more frequent, leading to a higher risk. Record breaking heat and hotter weather over the long term in Queensland will worsen fire weather and the impacts of bushfires. 2) Queensland is experiencing an increase in hot days and therefore an increasing number of days with high fire danger. Communities, emergency services and health services across Queensland need to keep preparing for this risk. Conditions conducive to bushfires are expected to increase in coming decades in Queensland. Increasing severity, intensity and frequency of fires throughout Australia will strain Queensland’s existing resources and capacity for fighting and managing fires. 3) Stronger climate change action is needed to reduce bushfire risk. Australia’s emissions reduction target of 26-28% on 2005 levels by 2030 is not sufficient to protect Australians from worsening bushfires and extreme weather events. Australia must reduce its emissions rapidly and deeply to join global efforts to stabilise the world’s climate and to reduce the risk of exposure to extreme events, including bushfires. "Climate change is driving increasingly dangerous fire weather by intensifying the hot, dry and windy conditions that Queensland is experiencing this week. These never before experienced conditions are occurring at a time when the planet has warmed only 1 degree Celsius on average, and such extreme events are set to get much worse as warming continues. "Over the coming years, we will see extreme fire weather like that of today become increasingly frequent, and increasingly dangerous, and these events will occur in new areas that have never previously experienced such risk. As more frequent and even concurrent extreme events occur, fire-fighting resources will become very thin on the ground and firefighters at considerable risk of fatigue. The increasingly extreme conditions firefighters are working in puts their lives in danger. "With climate change, fire prevention also becomes much more difficult as the ‘safe’ seasons for controlled burns, for example, become much shorter. 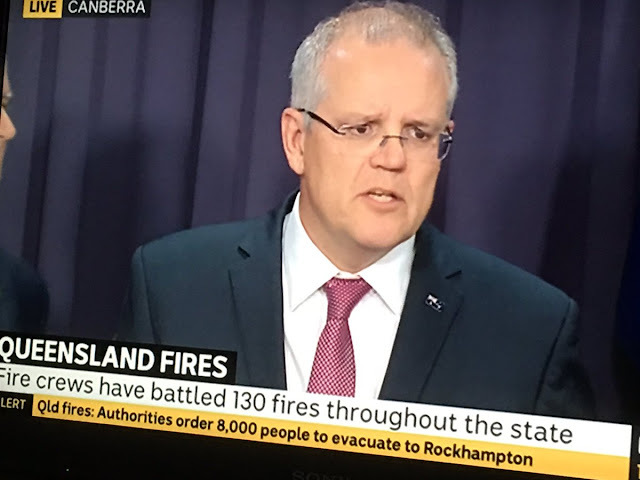 "While bushfires in Queensland have resulted in fatalities, they have not been regarded generally as a major hazard for life and property in that State—historically, cyclones have been of most concern. "The fires now threatening lives and property north of Bundaberg are consistent with what Australian climate scientists concluded a decade or more ago: we should expect more frequent and more severe extreme weather events and the dangers these bring. We need only to cast our minds back to what were regarded as “unseasonal” bushfires in Victoria and NSW earlier in the year. "We must accept that climate change now means (a) more areas of Australia are at significant risk of bushfire attack, and (b) the annual fire danger period is longer then we were accustomed to previously. These pose new challenges for governments, fire and land management agencies, and communities." Flying fox colonies are seeing mass deaths with the mammals literally falling from the trees. Flying foxes have a physiological temperature threshold of about 41 degrees Celsius. Above this temperature mass mortality in their colonies results. They are our canaries in the coal mine of climate change. Larger bat species like the Grey Headed Flying Fox are a signature species which have a temperature intolerance to heat at 41-42C which may impact ecosystem services such as pollination and seed dispersal. (Welbergen, Klose, Markus and Eby 2008) The heatwave in 2014 in southern Queensland took a massive toll on this species particularly affecting young and lactating females. Reef scientist Professor Terry Hughes said on twitter: "This is terrifying. An early summer heatwave breaks all records, lifting the chances of another episode of coral mortality on the #greatBarrierReef next Feb/March." Over half of the Great Barrier Reef has already suffered back to back coral bleaching from marine heatwaves. The present record heatwave may cause another coral bleaching event over the 2018/2019 summer.